Before I get into reviewing these products I want to give you a little run down on my skin. As a teenager, I had fairly good skin, some breakouts here and there but nothing crazy, my skin was pretty normal & easy going. Now that I'm in my 20's my skin has done a total 180. It's insanely sensitive to the point where I can't use many products because they will cause severe irritation, yikes! Now, this is where Pura Organics comes in! What I love most about this skincare line is that I can pronounce all of the ingredients, which is important to me. I like to know what exactly I'm slathering all over my face. This skincare line is perfect for any girl looking to treat her skin well & prevent the signs of aging, which who wouldn't want to do those things!? So far I've tried two of their products which I'll talk more about below. I've always preached about how important it is to moisturize your skin morning & night but I usually snark a little at the thought of an extra step under my eyes, I mean does it really make a difference? After using this product for a few weeks I can tell you yes it really does make a difference! When you apply this gel it goes on smoothly & you can feel your undereye tighten as it dries! I've found this product to also work around the nose/mouth area where you might have some fine lines. 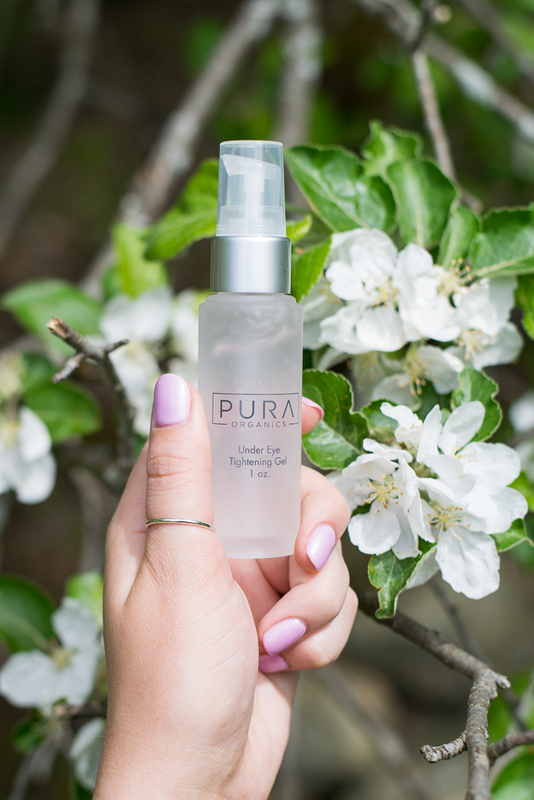 This product comes in a beautiful glass bottle with a pump to dispense the product. I love leaving it on my vanity because it looks so beautiful! On a side note, your undereye makeup will look SO much better after using this product! 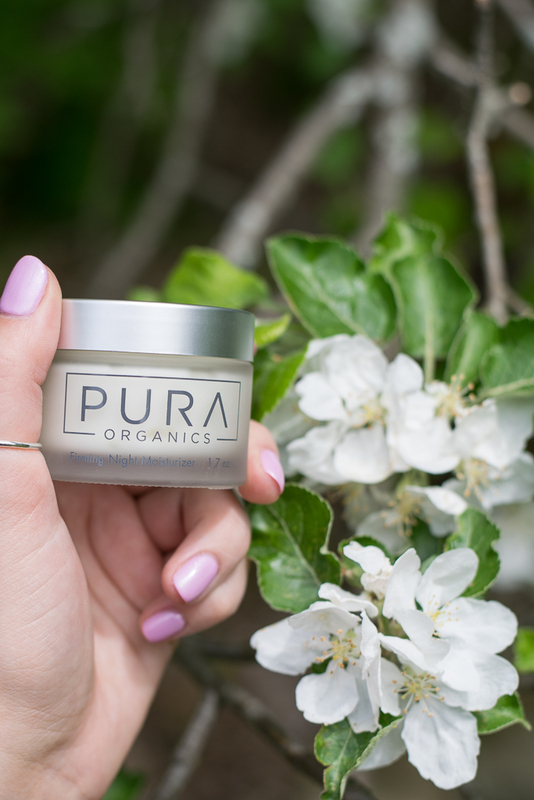 I've had a really hard time lately finding a super hydrating moisturizer that doesn't contain the ingredients that irritate my skin, I was excited to see that this Pura Organics moisturizer would work for me. My favorite thing about this product is the scent, I'm not really sure how to describe it besides the word decadent! This cream is fairly thick but soaks into your skin fast. I use it at night & in the morning under my makeup. I find that my makeup lasts longer and looks better because my skin is so hydrated. This product is one that you only need a small pea size amount of to cover your whole face, so it should last you awhile! 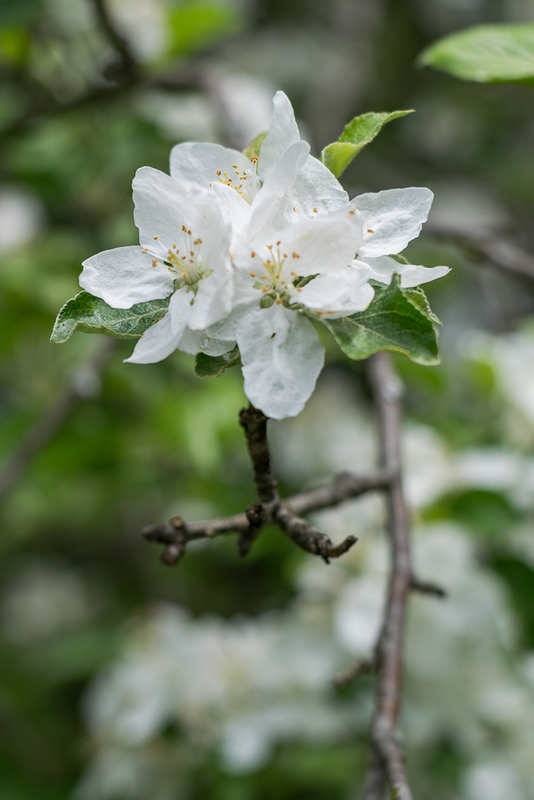 Hope you've enjoyed this post, let me know if you try any of these products! * These products were sent to me by Pura Organics for my review, all opinions are my own. Thank you for supporting the companies that support me.